I have lived in Nice for Eight years, and never before had I visited the Foire de Nice, an annual exhibition held in the somewhat sixties environment of the inappropriately-named Acropolis. It was with interest and pleasure, therefore when I received an e-mail from Varduhi Tovmasyan, an Armenian resident on the Côte d’Azur. This year’s Foire de Nice featured a delegation from Armenia, whose capital city, Yerevan, is twinned with Nice – something I never knew. 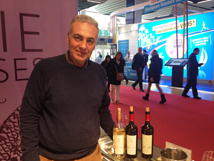 The Armenian stand was to feature a wine producer – would I like to go along and taste the wines? Well, of course I would! Not least because it would give me a chance to see exactly what the Foire de Nice is about. Sort-of like a nineteen fifties Ideal Home Exhibition crossed with a poor UK Saturday market and jumble sale, as it turns out. Fortunately the wines of Van Ardi, presented to me by the owner, Varuzhan Mouradian, were well worth the journey on their own. My knowledge of Armenia was very limited indeed. I could have spotted it on a map, I think, and I knew that there was some, er, discussion about whether the summit of Mount Ararat, final resting place of Noah’s Ark apparently, was in Armenia, in whose fokelore and imagery the huge mountain features heavily, or in eastern Turkey. The latter I think, on some legal basis, although to me it will remain Armenian. Some friends of mine climbed Ararat last summer, and that kind of thing being my kind of thing, I was jealous then and remain so now. More so in fact. One day! 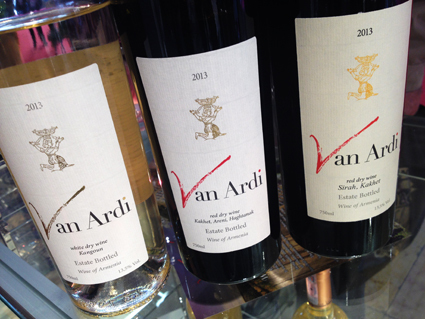 Anyway, on to the wines of Van Ardi. Varuzhan has spent a long time in California and speaks perfect, unaccented English. He returned to his homeland to make wine after deciding that this offered more potential than doing similar in America. I’m glad he did. 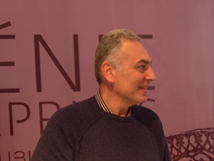 Despite 6000 years of vine cultivation, mainly producing sweet wine and brandy, and selling largely in Russia (in this respect Armenia is rather like Georgia), and a liberal government arrangement favouring small production farmers, there is not much new investment going on in general. Varuzhan’s vineyards were only established 5 years ago, and already the wines are showing amazingly well. A mixture of local varieties, and a few international ones, including Syrah are planted, on their own roots, in the vineyards at 1000m altitude, making them decidedly cool climate, although not needing the winter burial that those in the more exposed areas of the Ararat valley need, there is lots of potential here, and the plans for the new winery certainly looked very impressive to me. Made from the local Kangoun variety, used for brandy traditionally and related to Georgia’s Rkatsiteli (a pink grape whose wines are often orange-tinged). This was quite phenolic – lots of flavour and strength from the grapes’ skins. Lending the grapefruit and pear fruit flavours a deep structure and some bitterness. No oak and an intense style. I really liked it, but they have toned down the skin contact from the 2014 vintage, which is both a sound commercial decision and a bit of a shame for me personally. A balance is there to be struck. This was clean and fresh, made in a modern way but with a decidedly European style. Really good. A mixture of Areni, Kakhet and Haghtanak grapes (the latter being the same as Saperavi of Georgia and elsewhere). This was bright and vibrant – rather like a Mencia from Spain to me. There was a little structural oak flavour, but not overpowering the fresh blue fruit notes. Well made with a long, dry finish. This top red is a blend of Syrah and Kakhet, and really good. Lots of oak apparent, lending a sweet, spicy flavour, but backed up with plush and deep black fruit and the violet twang of pure Syrah, as well as a savoury hint. It is very difficult to believe this wine was made from vines only 5 years old, and I am sure that as the vineyards age the wine will become even more distinctive and developed – surely one to watch. Terrific wines, which have given me a thirst to explore more – maybe even one day to visit such an exotic and enticing sounding place!